These pages will have an episode guide, general information and pictures from this 1984-5 NBC Sitcom. #'s indicate season in which actor appeared on the series. 8 Dec 84 Do You Believe in Magic? 30 Mar 85 Where's Poppa? This sitcom about twin high-schoolers�one zany, the other serious�was reminiscent of The Patty Duke Show some two decades earlier. 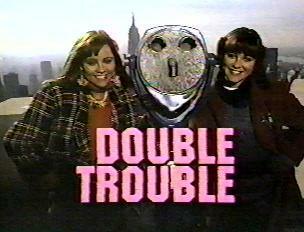 There were two principal differences, however: in Double Trouble real-life twins played the leading roles (while Patty Duke had played both roles herself), and The Patty Duke Show lasted three times longer. 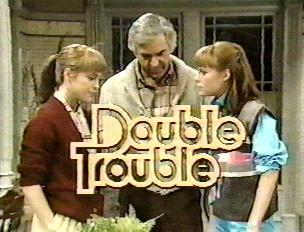 When the show premiered in the spring of 1984, it was set in Des Moines, with the twins in high school. 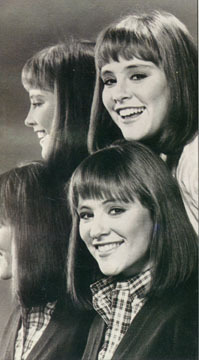 Jean Sagal played Kate Foster, the headstrong, impulsive twin; and Liz Sagal played Allison, the studious, sensible one. Also featured were Donnelly Rhodes as their widowed father, Art; and Pat Richardson as Art's woman friend, Beth McConnell. When the show returned in the winter of 1984, the twins had moved to New York City to live with their aunt, with Allison studying fashion design and Kate hoping to become an actress. Rhodes and Richardson were gone. Joining the cast were Barbara Barrie as the girls' aunt, Margo Foster, author of the "Bongo Bear'' kids' books; James Vallely as Charles Kincaid, and Jonathan Schmock as Billy Batalato, two actors who also lived in Margo's townhouse; and Michael D. Roberts as Mr. Arrechia, Allison's pompous fashion instructor.